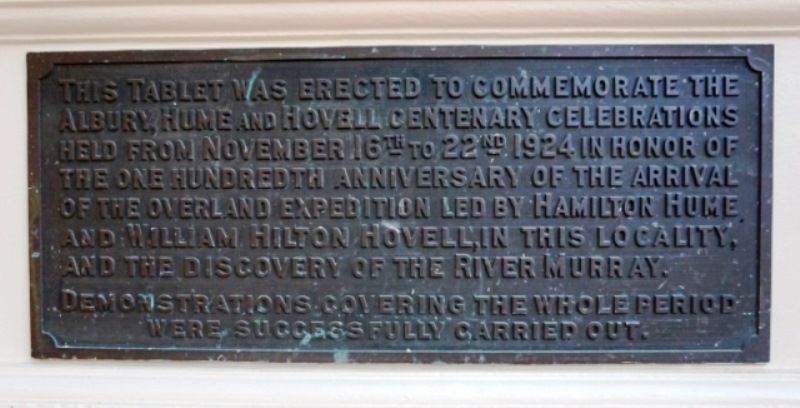 A plaque commemorates the centenary of the Overland Expedition led by Hamilton Hume and William Hovell to the Albury area in 1824. The Hume and Hovell expedition was one of the most important journeys of explorations undertaken in eastern Australia. In 1824 the Governor of New South Wales, Sir Thomas Brisbane, commissioned Hamilton Hume and former Royal Navy Captain William Hovell to lead an expedition to find new grazing land in the south of the colony, and also to find an answer to the mystery of where New South Wales' western rivers flowed. The party set out from Appin near Sydney in October 1824, and travelled south to the Murrumbidgee River near the site of Tumut. 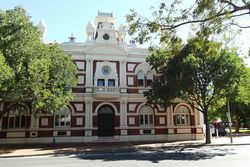 They crossed "a noble stream" which they named the Hume (now the Murray River) near the site of Albury, and then advanced into what is now Victoria. This tablet was erected to commemorate the Albury, Hume and Hovell Centenary celebrations held from November 16th to 22nd 1924 in honour of the one hundredth anniversary of the arrival of the Overland Expedition led by Hamilton Hume and William Hilton Hovell, in this locality and the discovery of the River Murray. Demonstrations covering the whole period were successfully carried out.